If required, please enter the date for the keychain in a numerical format ie., 28.05.11. 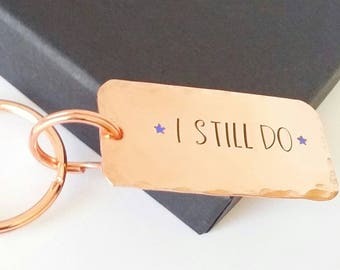 This personalised copper keychain is a great 7th wedding anniversary gift, couples gift, birthday gift or Christmas gift. 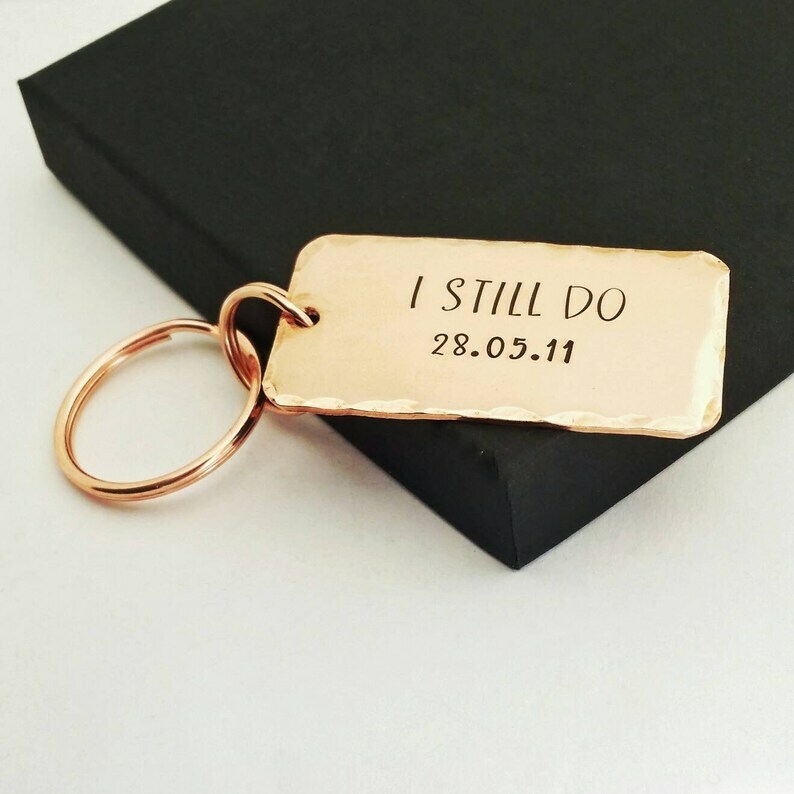 The copper rectangle will be hand stamped by me with 'I STILL DO' and a date of your choice. 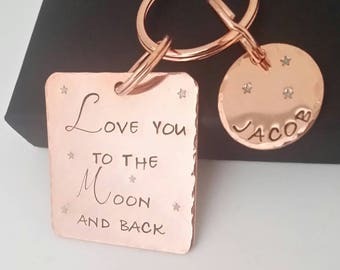 The keychain will be stamped in UPPERCASE in the font and style shown. Please select the date option and leave your custom date in the numerical format you would like stamped, in the "Add a note to EloiseBJewellery" section during checkout. If the custom date is not given in a numerical format, it will be stamped in the same format as the photo. If a date is not required, the wording will be centred. 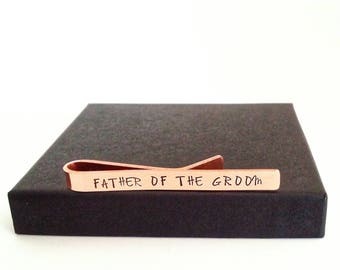 The 45mm x 25mm 100% copper rectangle has a slightly dimpled texture, it has been hammered on the edges and comes with small split ring, a large split ring or swivel clasp all with a copper finish and a gift box. Hand stamping is a procedure where individual characters (letters, numbers, designs, etc) are hammered into a chosen piece of metal. Hand stamping is unique to each piece and therefore each character may not have equal depth, spacing or alignment and may have an imprint on the reverse. Please be rest assured that this is normal practice for hand stamping and should not be compared to engraving. This is not deemed to be a fault with your item but is the unique character of your piece. Please be advised that I may refuse to stamp wording that I feel is offensive or obscene. 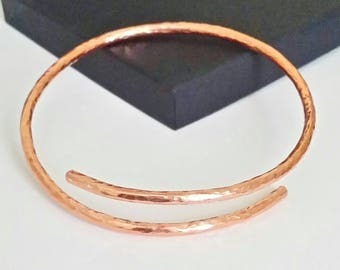 The brightness of the copper will darken quickly, which forms part of the beauty of copper, but there are plenty of easy cleaning methods (I use white vinegar and salt) which can be found online. 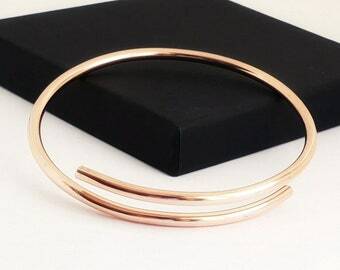 Thank you for visiting Eloise B Jewellery Designs. Beautiful item and delivered super fast, thank you. I definitely recommend. Perfect gift. Mother in law delighted! Despatched in super quick time, which I was so grateful for. I love it. 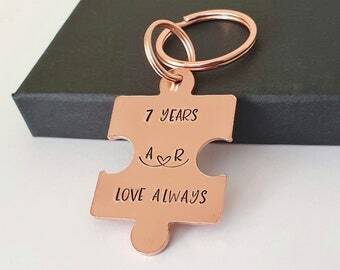 It’s perfect for an anniversary gift. 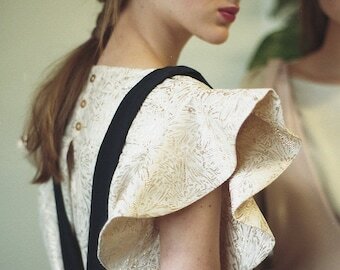 Excellent quality and exactly as described. It also arrived very quickly. Hand stamping is a procedure where individual characters (letters, numbers, design stamps, etc) are hammered into a chosen piece of metal. 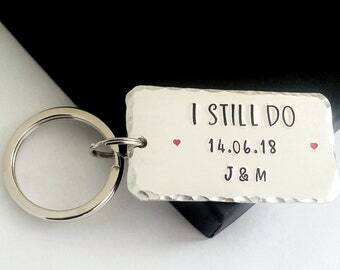 Hand stamping is unique to each piece and therefore each character may not have equal depth, spacing or alignment and may have an imprint on the reverse. Please be rest assured that this is normal practice for hand stamping and should not be compared to engraving. This is not deemed to be a fault with your item. 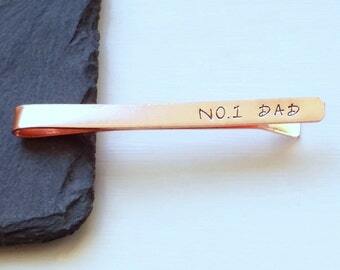 I use sterling silver and copper for jewellery and various metals for accessories. Aluminium is a strong, substantial metal, but it is very lightweight and can be easily scratched. Please be advised that I may refuse to stamp wording that I feel is offensive or obscene. Delivery methods may require a signature on receipt. If you are out when your parcel is due for delivery, your postal worker should leave you a notification card, which will give you information on how to collect your parcel. Please ensure that your dispatch address is correct. Items that have been returned as undeliverable due to notification of an incorrect address, or returned via a postal service as uncollected will incur a charge to be sent to the correct address or reposted. If the item was delivered free of charge, you will be required to pay postage. The item purchased will not be refundable. If you receive an item that has been damaged during transit, please send me a message via Etsy within 24 hours of receipt. Please do not shower, bathe, etc with your jewellery on. Should your goods come into contact with perfume, body cream, hairspray, or similar cosmetics, they may discolour. I suggest you avoid contact with such cosmetics whilst wearing jewellery or at the very least, wait 10 minutes after use before wearing your jewellery. If you are sensitive to metals, I suggest you patch test your goods. Always keep jewellery out of the reach of small children as they may cause chocking or damage. Metals such as sterling silver, copper and aluminium will tarnish or patina over a period of time. I would advise using a metal polishing cloth to keep your metals looking pristine and a slightly damp chamois cloth for your pearls and gemstones. The laws of the United Kingdom apply to all sales and any claims brought will be dealt with under UK law. If a claim is made, it will not exceed the invoiced price of the goods purchased. 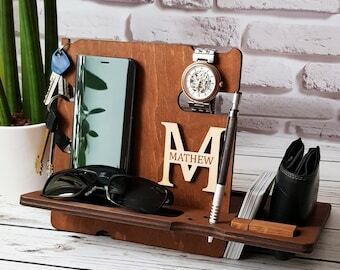 If you would like to return an item other than stated above, please send me a message via the notification section on Etsy. Earrings are non returnable if the hygiene seal/label has been broken or removed. You will need to pay the postage charge to return the item. If the item is not returned in its original saleable condition, you will be responsible for any loss in value. You will be refunded the cost of the goods but not the original or return postage charge. For items being replaced by the request of the buyer, the postage to return and replace the goods are due from the buyer. 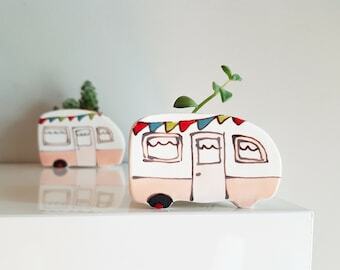 If you receive an item that is faulty, please send me a message via the notification section on Etsy. You may be requested to return the item before the correct item is posted out to you in order to determine or rectify the fault. You will, however, be fully reimbursed for the outgoing postage if the item is found to be faulty. Orders that have not been received will be not refunded or remade until they have been considered lost by Royal Mail, which is 10 working days after the order was due for the UK. 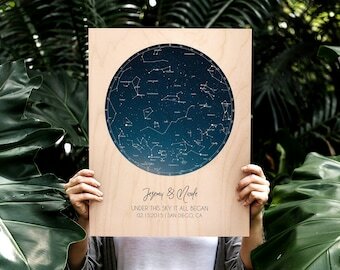 International orders can take up to 7 working days for delivery and are not counted as lost until 20 working days after the order was due for items being sent to Europe and after 25 working days for everywhere else. All the jewellery (bracelets, necklaces, chains, earrings, rings, etc) and accessories I make are for adults and are not suitable for children, as they contain beads and small objects. Small objects can be a choking hazard and you are advised to keep all jewellery out of the reach of children.